Are you having emotions that make no sense? Do you feel your body reacting to things that you cannot explain? 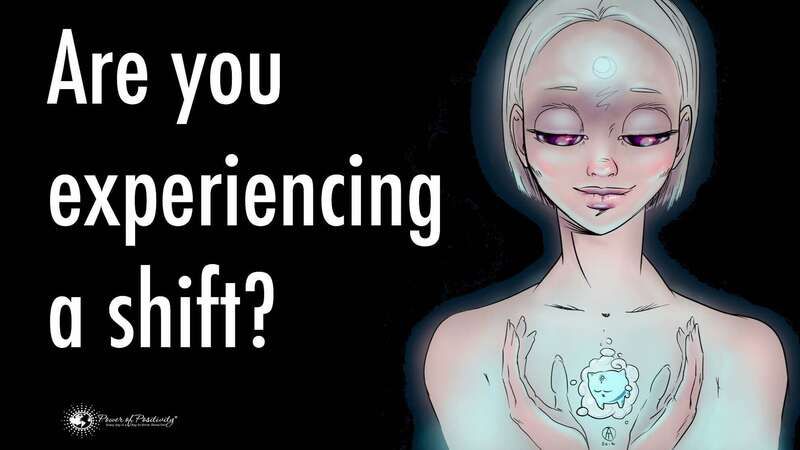 You might just be experiencing a shift in consciousness. This collective movement is happening right now and some people are unaware that things are happening in the metaphysical world. 1. A strong desire to be alone. As our bodies enter higher frequencies there is a longing for alone time. We begin to feel overwhelmed by the world’s stimulation. There is little need for television or company. This lasts a little while and it should be honored. You are not falling into a depression. You are shifting to higher elevations of vibration. You do not have to become a hermit. Turn off the phone, shut the computer down, and just allow your body to recharge from the over stimulation. 2. An urgency to quiet the mind. You may find yourself craving meditation and prayer time every day. You will feel that during those moments you are connected to a higher purpose. As consciousness shifts and expands the mind will crave quietude. You may also feel intense headaches in the crown area. These are common and heavy conscious breathing helps. Yoga, hiking, or just sitting and detaching from the mind’s chit chat is helpful as well. 3. Feeling overly sensitive around others. We are all connected through a web of collective consciousness. As you begin to wake to this awareness, your emotions take a beating. You feel the negativity of others. At times you can sense what they are thinking and feeling without knowing them. This “web” is our connection to Source. Imagine, if you will, the Internet and the endless source of information at our fingertips. This is the same when the mind begins to vibrate at a higher level. You connect to the emotions of others. These are the moments that require grounding, such as going outdoors and feeling the earth under your feet. 4. Wanting to change jobs, homes, or your entire life. As we begin to reach a higher level of awareness, there are things that no longer fit in our lives. Our purpose starts to get questioned, “Why am I doing something I don’t enjoy? What am I doing in this place?” That job that you thought you loved and worked so hard to attain may no longer feel fulfilling. That house that you once wanted so desperately because it was going to make your dreams come true, also doesn’t fulfill you. These changes seem to come in waves. Before making a rash decision, take accounting of what truly makes you happy. Find your authentic truth. Perhaps it’s time to push the reset button and begin doing something that makes you smile when you get up in the morning. This awakening of soul also pushes us to want to help others. We are no longer driven by materialism. 5. Removing toxic people from your life. During this massive shift you start to become physically, emotionally and spiritually stronger. Impatience and intolerance start to appear when you are around people in your life. You will no longer tolerate the drama around you. You start to take into account your relationships and those folks who bring you down. It’s not an easy decision to make but you will find yourself ending friendships, setting boundaries, and removing all those who do not have your best intentions at heart. Once this happens things begin to clear in your life. Toxic energy is a lower form of vibration. In order to continue moving through the shift you must get rid of the “dis-ease” in your life. 6. Following your inner guidance. Have you woken up from a dream and felt as if you had been traveling? It didn’t seem like a dream at all. It probably wasn’t. Your inner guidance (or higher self) is communicating with you. There is a massive sense of bliss and joy that enters when you know what you know. This feeling of elation is that inner voice that comes from your soul. Follow that. Follow what makes you happy and it will strengthen your authentic purpose in this world. 7. Changes in sleep patterns. Studies have shown that we are not meant to sleep eight consecutive hours. During times of conscious shifting you will find that there are interruptions in sleep patterns. You may have a first and second sleep: Three or four hours when you initially fall asleep, and then a break. The second sleep happens after being awake for an hour or two. It is during the waking moments that the mind begins to feel as if it’s receiving information from something deeper. The ego is not present. This is a great time for creating, meditating or writing. 8. Signs and synchronicity appear often. Have you been seeing 11:11 or 333 everywhere? Do you keep seeing a certain animal everywhere as well? These signs and synchronicity are forms of guidance to stop and pay attention. The ego will do anything it can to keep you busy. If you stop for a few moments to acknowledge these small signs, there might just be a message from your higher self. Pay attention. Whenever you ask for guidance allow the higher vibrations to show you the way through small occurrences. 9. Old issues and memories keep coming up. As you continue shifting and expanding to higher frequencies, old stuff from the past will come up. Perhaps you need to work on self-esteem and self-worth issues related to family or relationships. These issues will play out with new people or in dreams. You cannot return to the past, but you can release old patterns and behaviors. Make peace with decisions. Regrets are toxic. Learn from all those experiences that have brought you to this moment. You get to create and decide what happens today and tomorrow. Part of the spiritual shift is allowing for things to come through and releasing them once and for all. 10. Changes in eating habits. You may find that you gain weight during this expansion process. Food allergies might also appear with foods that you have eaten all of your life. Let them go. Your body is adjusting to its new vibration. Find moderation in food consumption. Anger, fear, resentments gather up in our bodies forcing us to “hold on to” weight. That last thing you need to do is freak out about this gain weight but become aware that it is a reminder of letting go of all control. Eventually with self-care and awareness your weight will come off. One of the most powerful signs of shifting consciousness is the complete awareness that you are the creator of your life. You begin to de-clutter the old parts of you and start to manifest the things you want. You will begin to see that whatever you put out into the world becomes a part of your reality. With that said, be careful to stay positive with your thoughts because negative energy is a lower form of vibration and it creates quicker than higher vibrations. Your experiences are natural. Humanity is shifting and healing. Give yourself permission to move through the ego-based mentality into a higher form of love and understanding.